WED and THURS POST: Another 'across the pond' sharing so 'day ahead' posting. 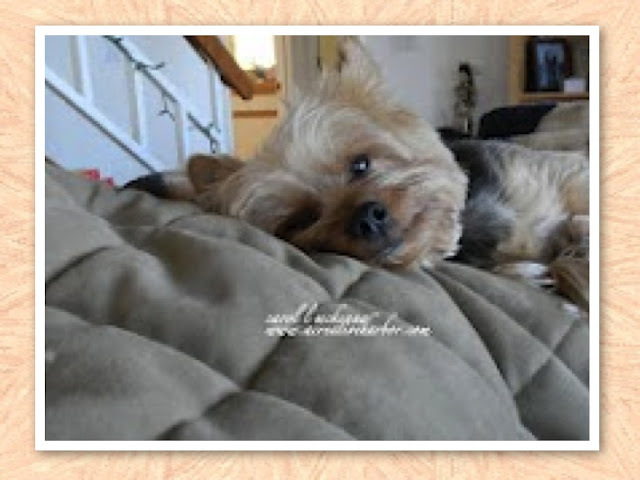 The above photo is of ArtMuse Dog (not her real name) to me is the ultimate expression of Love and Loyalty. She weighs all of 8 lbs but it filled with love and a delight in my life as well as others. Wherever I take her, she 'steals the show'. She is there when I am creating and there when I am writing this blog as well. She works hard, plays hard and has a real knack for napping. Yet, she is a wonderful blog assistant. Do you have a blog assistant? 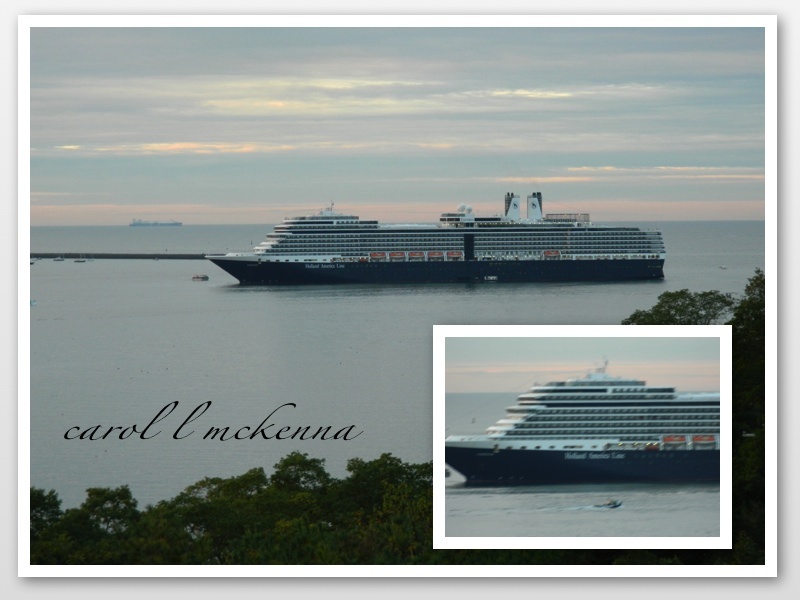 Yep, upon awaking I was greeted by this wonderful cruise ship out side my window in the Cape Ann Harbor. We now have several tourists ships that arrive in the Fall on our lovely island of Cape Ann. oops, fell in black hole. My creativity is needing a walk on the beach and it is 70 degrees here so guess it is a good thing that I had to post early for the European blog. Do hope you enjoy the photographs and haiku and will hop over the pond to view even more. It would be hard to find a blog assistant more loyal and lovable than that! Love the creative helper who is so loving and loyal. Love the way he is looking at you. She is the cutest little thing. Love the ship pic. Love and Loyalty - man's/woman's best friend! Oh how I miss having animals. It is so nice to come to different blogs and see all the cute animals everyone has. ArtMuse is such a cutie and she knows she is LOVED! Your creative helper is adorable! Thank you for sharing your beautiful poems and pictures! Have a great day tomorrow. So cute dog , I was so happy when I saw your pictures. The dog has an happy face. Why, yes, I do have a blog assistant. In fact, I have two of them, both Labrador Retrievers one each of the boy and girl varieties. :) Love seeing the cruise ships. Great poem and AWESOME blog assistant!!! My kids would like to get one much like yours, but you know who'll be doing all the care taking and walking...!!! Thanks for the visit and have a great week. I love little ArtMuse Dog. Too cute! As you know, my Cody, is never far from my side either. Perfect companions! That's the view from your window?? I'm green with envy! What a cutie...the doggy. Gorgeous view you have...thank you for visiting and leaving a nice comment. They just don't steal shows; they steal hearts as well. Oh I love dogs! What a very "cute" assistant! Your muse is so sweet! I have mine, too, as you know--LOL! Those cruise ships are so huge!! Amazes me that they can float at all. 8 lbs of love-I think our cat weighs more than that! But,so sweet. I imagine the cruise ship is there for the fall colors? You live in a most beautiful place and your ArtMuse pup is so adorable and looks like the perfect companion! Lucky, lucky you....living on an island....no wonder you are always so inspired. Lovely picture of your little assistant! What an adorable helper. The ship scene is beautiful. Great haiku! nicely done - and i loved that last lined. Nice photo of the tourist ship! And I always love photos of your "assistant". I wish I had one! Are you out of that black hole yet? Hope so! Your assistant is Beautiful; aren't we fortunate, Carol, to have beloved animals to share our lives? Well I have the same assistant...BUT one BIG difference!! Mine trys to do anything he can to stop me from blogging so i will play with him instead! Nice pics. youre showe.... I like youre dog. Awww...she's adorable and obviously the perfect assistant :) Great photos today. I would love a walk on the beach! Sweet dog! I guess my muse would be my boys - they sure give me lots of blogging material! What a sweet puppy. Mine looks a lot like yours. She's a Silkie. The ship picture is very nice but I am LOVIN' that Pup Pic the most. She is so darn cute! i love your adorable pup! your post brings a smile to my face. Wish I could go for a walk in the beach as well. Catching up with ABC. Got busy the past couple of days and just now have the time to visit entries. I don't have a blog companion, just little old me plugging away eating lots of food, drinking lots of wine! What a cutie! The view out of your window is gorgeous! Wonderful photos of both your friend and the cruise ship. Something lovely to wake up to! What a sweet assistant you have. Oh yes, I usually have assistants laying across my arms as I type!!! What a pretty photo of the ship, too. Lovely pictures! Creative Haiku! What a love your assistant is! What a view you have from your window! Your blog assistant is adorable. The view out your window is spectacular! A postcard lovely capture of the ship. Your assistant is a cutie. Mine is of the feline variety and usually snoozes on the wicker settee behind me in the sunroom. It's nice to have company. I don't have a blog assistant, although I'm getting one tomorrow. Tomorrow (Friday) we're adopting a puppy. Yikes! Well I have several blog assistants -- yet they seem to distract me more than assist me. Cute post, Carol. 70 degrees...wow. I know it was in the 90s in CA this week, but in UT in the mountains we barely hit 50 today. crisp. cool. fall. I'm looking forward to 60 degree temps in Oregon! It's still just under a 100 here. You have a terrific little assistant there.